New Zealand's bid to extend their winning streak to a tier one-record 18 Tests ended in a dour draw against Australia in the first Test of the Rugby Championship, the All Blacks left hanging on in the second half after two players had been sin-binned. The All Blacks dominated territory and possession in the opening half-hour, their astute short kicking game particularly effective in the wet conditions, but Australia went to the break just six points behind after gaining momentum. And the margin could - should - have been closer given that Wallabies captain Michael Hooper ignored two incredibly kickable penalty attempts and Kurtley Beale's 40th-minute kick hit the right post. Australia got on the front foot in the second half, with New Zealand prop Wyatt Crockett in the sin-bin for the opening minutes after being carded and the latter moments of the first stanza, and replacement fly-half Beauden Barrett binned for a breakdown offence. The latter card, in particular, was key as it left the visitors struggling for direction behind the set-piece with Ma'a Nonu also off the pitch with a shoulder injury. Australia conceded a penalty with their last play of the game, when rumbling on attack in the New Zealand 22, leaving New Zealand attempting to run 70 metres to extend their winning run; but such adventure and execution would not have fitted what had gone before and, sure enough, the ball was spilled into touch for a result that left neither team satisfied. "It's a bit of a funny feeling," New Zealand captain Richie McCaw said. "It was a hell of a battle out there. Conditions played a big part and it was tough to play with the ball and any fluency. At the end of the day, 12-all was probably a fair reflection." McCaw lamented the "little bit of ill-discipline" at the end of the first half "that let them get momentum back, and we perhaps struggled in the second half to get pressure on at the right end of the pitch". "We went pretty well for the first 25-30 minutes, but struggled to maintain that. 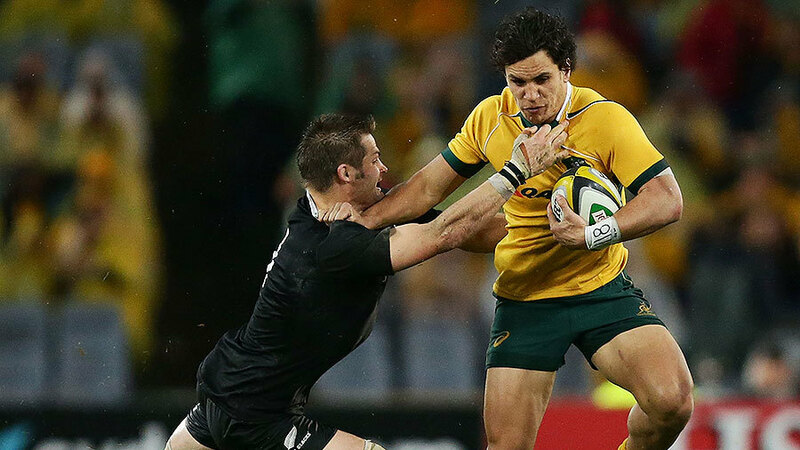 The Wallabies fought back well." Hooper said the result "feels like a loss because we got so close", lamenting, in particular, first-phase errors and decision-making. "We let ourselves down" with the turnovers," he said. "We improved as the game went one, but we've just got to be more clutch at those times." Those clutch moments included two pivotal plays in the second half. The Wallabies, though, were unable to capitalise and were left to rue a succession of missed opportunities in the second half. 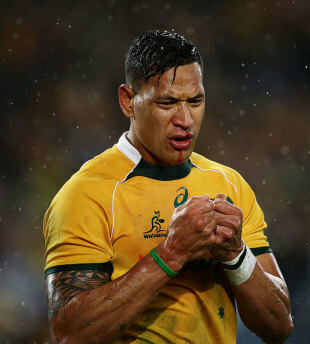 Israel Folau squandered Australia's best try-scoring chance in the 54th minute. Under pressure, Aaron Cruden's attempted clearing kick from inside the New Zealand in-goal area landed straight down Folau's throat 30 metres out from the All Blacks line, but the fullback's wild pass flew over Beale's head and the opportunity with a three-man overlap was lost. The Wallabies had to settle for another Beale penalty goal instead, his third, which tied the match up, but Cruden replied two minutes later to nudge the All Blacks back ahead 12-9 after an hour. Moments later, after multiple phases on the New Zealand line, Wallabies winger Pat McCabe seemed certain to score only to be piled into touch after Nathan Charles failed to delay the pass to draw a defender. Beale, moments later, took the opportunity to lock the score with his fourth penalty, and neither team could break the deadlock in the final 10 minutes. Wallabies coach Ewen McKenzie said simply that Australia "carried the ball well at them and forced some errors and opportunities; we just weren't good enough to make the most of some of those opportunities - not that there were that many". "There was some good kicking tactics from them, and some friendly fire of our own; we let ourselves down a few time sat set-piece and put ourselves under pressure. But on the whole were able to put some pressure on them, and a draw's a difficult result for both teams." New Zealand coach Steve Hansen said: "It was a muddling game ... a lot of mistakes ... we're very disappointed not to win, but there's a lot of pride in the performance" given they played with 14 men for 20 minutes.